Join us to celebrate and learn about Mexico's culture through this fun and relaxing workshop! Learn about Gdesigns Alebrije artists Seny & Reyna, their story, inspiration, and technique. Guelaguetza Designs’ mission is to foster cultural diversity by providing workshops and community events, selling fair trade products to sustain artisan jobs, and preserving ancestral techniques. Our workshops are a tool to continue building cultural bridges in our community. We aim to inspire people of all backgrounds to embrace their own cultural heritage and be excited to learn about the cultures and identities of others. We are passionate about sharing the art and culture of Mexico, and encouraging others to share their culture with us in return. Cost per person is $18 dls. 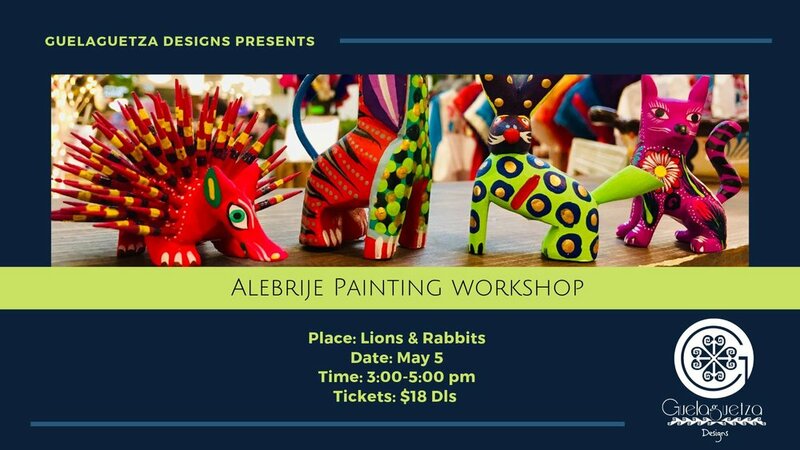 Workshop includes 1 Alebrije and all materials. Nos vemos el 5 de Mayo!